Morning Star Home Science College is a regular arts and science college affiliated to Mahatma Gandhi University and accredited by NAAC. The college is the brain child of the farsighted thought of three visionaries- Mar Augustine Kandathil (former Arch Bishop of the Arch Diocese of Ernakulam), Rev. Fr. John Pinakkat and Rev. Msgr. Mathew Mankuzhikkari. The postwar, preindependence period in Kerala was a time of fast and disturbing changes in the social milieu of the state. They were deeply pained by the increasing instances of broken families, unwed mothers and orphaned children in many places around. They felt a dire need to lend a helping hand to individuals and families groping desperately through poverty, ignorance, illiteracy and the disruptive trends of the time. Their social concern and solicitude made them think of an apostolic mission for the well being of families. This led them to the founding of the Congregation of the Sisters of Nazareth in 1948 with the motto 'For God and Country'. Under their inspiration and guidance the Congregation fervently set about launching programmes of family apostolate at various levels of the society. A major part of the dream of the founders was about starting an institution for women's education. So, at a time when women's education was not even heard of, the Congregation started a Home Science College at Angamaly in 1963 - the first women's college of its kind in Kerala- with a vision of empowering young women as better home makers and thus enabling them to contribute a creditable share to the process of nation building. Rev. Msgr. Kuriakose Chiramel, Director of Nazareth Institutions and the founding Manager of the college undertook the task of materializing the cherished dream of the founding fathers. The college had a humble beginning in 1963 with a two year Diploma Course in Home Science under Sr. Teresitta CSN as Principal. The college got the present name Morning Star Home Science College in 1968 with the starting of an undergraduate course in Home Science affiliated to Kerala University and Ms. Mary Pothen, former Principal of SIET College, Madras was appointed the Principal. Morning Star is Virgin Mary, Mother of Jesus Christ, who is our Heavenly Patroness. The pioneers believed in the motto 'Learn to Serve, Serve with Love' and their faith was in the goodness rather than bigness of the service. Right from the tenure of Sr. Loyola CSN as the Principal of the college (1971-1992) the staff and students have joined hands in voluntary service to the nearby villages, thus imprinting a lasting mark on the society. Persistent popular demand necessitated the starting of the Pre Degree Course with two batches in Science and one batch in Arts in 1981. The college got affiliated to Mahatma Gandhi University when the University was established in 1983. For decades, Morning Star College has been marching forward with the leaping progress in women's education and has always shown readiness for innovation and diversification. 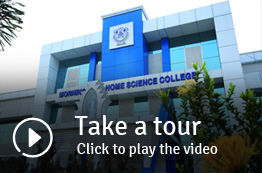 The college has been growing through the years introducing several new courses from time to time: B.Sc. Zoology (1993), B.A. Economics (1995), B.Sc. Chemistry-Vocational (1998), B.Sc. Physics- Vocational (1999), M.Sc. Home Science (2001), M.Sc. Zoology-Self Financing (2004), M.Sc. Physics-Self Financing (2013), M.Sc. Chemistry-Self Financing (2013), B. Com. (2014) and B.A. English- Self Financing (2015). Today, with four Post- Graduate Courses, seven Undergraduate Courses and six Certificate Courses, Morning Star College is a leading arts and science college under Mahatma Gandhi University. The college has come a long way from its humble beginning in 1963 and has the proud assurance that it has lived up to the vision of its founders. The aim of making women self reliant has been very well taken up by the college through different means including various vocational training programmes for the mothers of students and the local women. A one year Diploma Course and Short Courses of four months were offered in Nazareth Home Science Institute situated in the same campus till 2013. Now the Department of Home Science continues this tradition through two Certificate Courses- Fashion Technology and Home Science. Training in stitching, embroidery, flower making, cooking and painting along with awareness classes on home management, child development, personal hygiene etc. come under the purview of these courses. Located ideally at a convenient location right by the National Highway No. 47, this semirural college has been offering excellent academic training for girls from all over Kerala. The college provides hostel facilities for the needed in a safe and serene ambience. The college has always been keen at assuring quality in education and has confidently walked in for assessment and accreditation by National Assessment and Accreditation Council (NAAC) two times - in 2001 and 2009. The college was accredited at Three Star level in 2001 and secured B grade in 2009 with a Cumulative Grade Point Average of 2.8/4. While faithfully adhering to the vision of its founders, the college has diligently adapted itself to the changing needs updating its vision. Our objective is to mould young women as prudent scholars and competent professionals capable of being ambassadors of graceful service to the nation. And now, having completed 53 years of relentless service to the society, we stick to our conviction, as ever, that when we educate a woman, we are educating the nation itself.